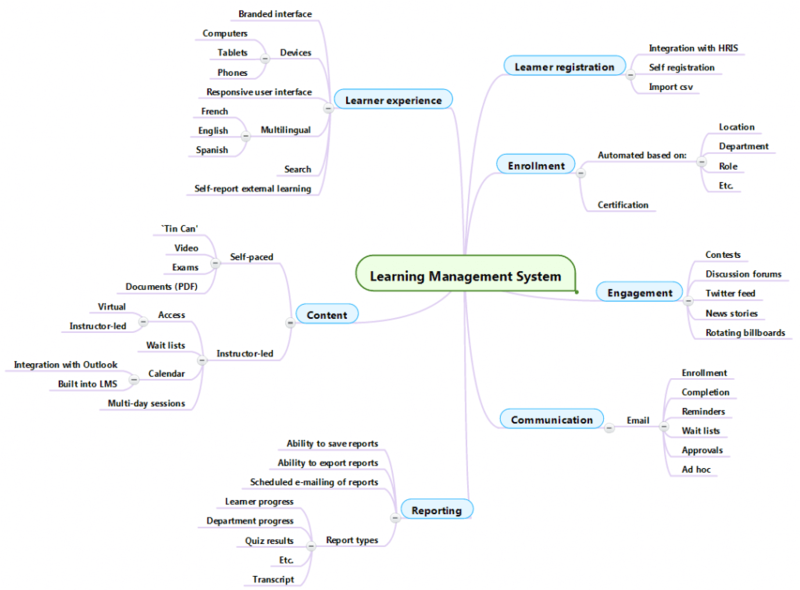 They contain a list of every possible LMS feature ever invented (of which the organizing acquiring the LMS will use a tiny fraction). They fail to differentiate high priority `must-have’ features from low priority `nice-to-have’ features. I’m pretty certain that within every organization, the ability of the LMS to track whether a classroom has a projector isn’t as important whether the system can serve learning content on mobile devices such as iPads. The smartest organizations I’ve worked with keep their requirement lists short and prioritize must-have features over nice-to-have functionalities. Prioritized lists of requirements help these organizations quickly weed out systems that don’t meet their needs, allowing them to spend their time doing a deeper dive into the systems that might be a good fit. The tool I used to create the image above is Mindmeister. Lifehacker recently published an article listing others you might want to investigate. Happy mind mapping!